I got this yesterday. Very tired looking, but I don't think this one is Chinese. The base is totally unlike any of my Chinese weights. But I agree it doesn't look Chinese from the base :? I think the previous owner must have let the kids use it as a marble, although having said that it is only 'grainy' around the base. The lady I bought it from said that she thought it was from Belgium. 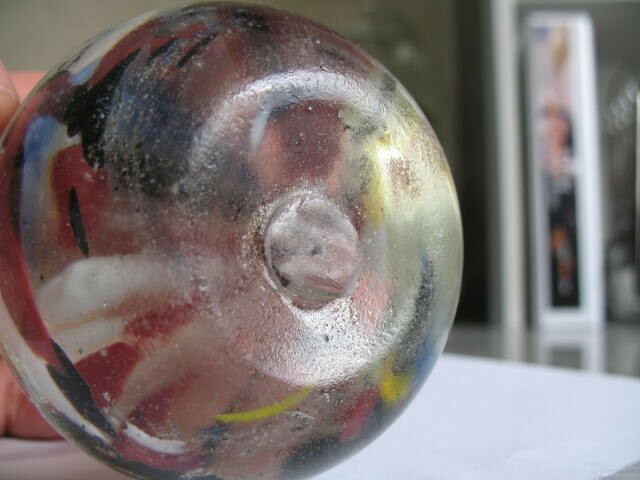 As yet I don't have any books on paperweights, they are on my list of things to get, but I think that I will have to sell some of my vases etc. first. I know some people are of the opinion that one should invest in 1 decent paperweight, but I want to get the 'feel' of the cheaper weights first. If you only get one good book on paperweights I would recommend Sibylle Jargstorf's 'Paperweights'. It's not cheap, but I got mine second-hand, so it wasn't too bad. It's a beautiful book and covers many different styles and areas of paperweight making. If you decide to specialise in a particular style of weight there are other books I would recommend, but I still like the Jargstorf. I agree about getting the 'feel' through collecting cheaper weights at first. Are you drawn to millefiori, lampwork, crimp flowers, or abstract weights? I have a large collection if crimp flower weights, (mostly Chinese, as you know) and some are very pretty and well made. Abstracts range from the wonderful Selkirk and Caithness examples, which can still be had for reasonable money, through Scandinavian, to 'Bohemian', modern Chinese or Indian, etc. Some Royal Crest are very good, but the quality control is perhaps a little less rigorous than in the Scottish weights. Thank you so much Leni. I have found the book you recomend on Amazon, I just have to look into the postage costs, or I could have it sent (free) to my daughter in the UK and she can bring it with her in April. 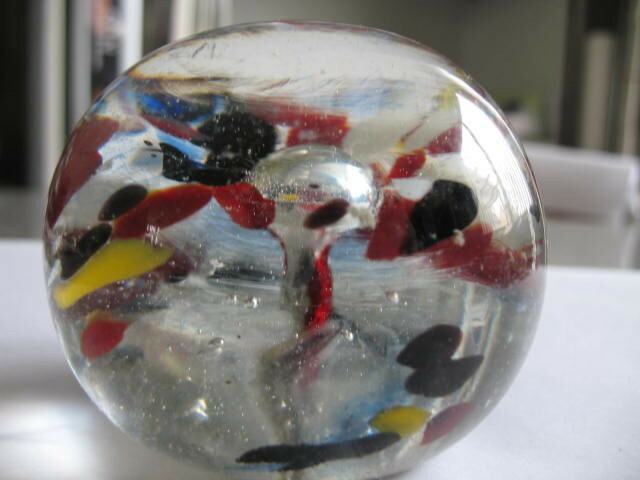 I am not drawn to any particular type of paperweight, although I do love millefiori and lampwork, but it is the skill involved in the making of them that has me enthralled. One day I hope I will mange to see one being made. I have been following the thread about John Deacons paperweights and you are right, he does produce beautiful work. I noticed that his son joined the board yesterday and I do hope he stays too. What sort of age would you say, Ray? I will "Google" in that direction. I have found ALIBRIS very good as a source for new or second hand books.